Hello. I need a H.264 hardware encoder for Mac to transcode videos with h264 codec for my phone, but I have a single requirement - it shall be capable of using the Intel hardware acceleration. I know there are some tools for Windows, any luck for Mac platform? It is a real waste that the CPU hardware acceleration technology just sits there almost idle, while the converter oversweats. Admittedly, the frequently-asked task- video transcoding translates into a surge in demand for faster processing power. Luckily that Intel has made it less of a problem with its cool feature named Quick Sync Video. But large-amount multi tasks are still in need of a more powerful hardware encoding h264 solution to accelerate the encoding time for H.264 videos beyond what the hardware acceleration technology alone can achieve. Namely, a hardware h264 encoder which can take advantage of Quick Sync Video is essential. With the popularity of smartphones, video transcoding becomes one of the most consumers of CPU power in order to carry the full HD/1080P content on the go. Basically, h264 hardware encoding is a CPU intensive task and to make it more efficient, Intel has developed a acceleration technology named Quick Sync Video for H.264. Simply put, Intel has developed a dedicated chip to accelerate the media processing speed. 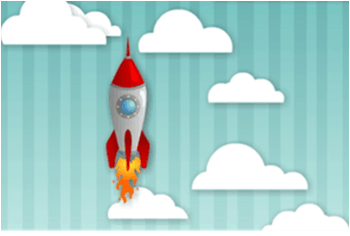 In other words, in video encoding like hardware encoding h264, as claimed by Intel, this hardware acceleration technology will save a good deal of time with dramatic performance gains. Therefore, a h.264 hardware video encoder that combines with this hardware acceleration technology will further reduce the time required for the encoding process. But currently, there is no such a hardware encoder that supports this technology for Mac platform. 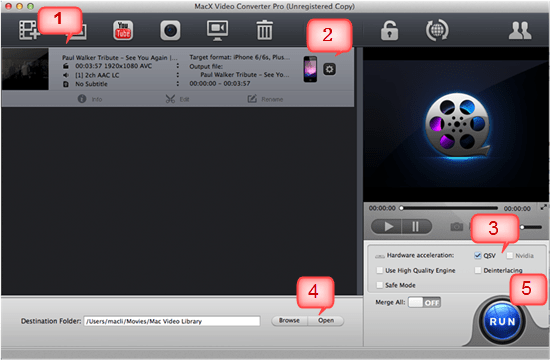 To cover the demand of even faster experience of hardware encoding for H.264 videos, now the FIRST Mac hardware H264 video encoder MacX Video Converter Pro, for the first time, takes full advantage of the advanced Intel Quick Sync Video (QSV) technology to significantly accelerate the hardware video encoding speed between various files like AVI, MP4, FLV, MKV, MOV etc to formats with H.264 codec on Mac platforms (Mojave) with hardly any quality loss. By leveraging Intel QSV, this hardware h264 encoder lowers the CPU utilization to ensure up to 16x faster encoding speed of H.264 UHD/HD/SD files for iPhone iPad Android devices on computers with Intel® SandyBridge, IvyBridge, Haswell and Broadwell processors. Combined with the hyper-threading technology and multi-core CPU utility, now users can enjoy up to 5x faster H.264 hardware encoding speed on Mac compared with other tools online, especilly when it comes to UHD/HD videos. What's more, as Intel Quick Sync switches most of the H.264 hardware video encoding task over a media processing unit in the dedicated processor graphics module, now more CPU are free up for other tasks while encode the H.264 files, like watching online videos, browsing the web pages etc. That's to say, with this H.264 hardware encoder, users can double advantages of bullet -fast speed and smoother processing experience with video transcoding. As for the quality, admittedly, there will be subtle quality loss, but it's almost impossible to tell the difference by human eyes. In the first comparison, we have compared the encoding time required for this hardware H264 encoder to encode 4K UHD, HD 1080p and 720p videos with and without QSV technology. All of those videos are encoded with H.264 codec. This hardware video encoder h.264 mentioned here is highly recommended for you to process, especially, various high-definition videos like 4K ultra HD 2160P, HD 1080P/720P for that it excels other H.264 hardware video encoders for Mac in delivering a superfast speed to encode H.264 video files with robust performance. 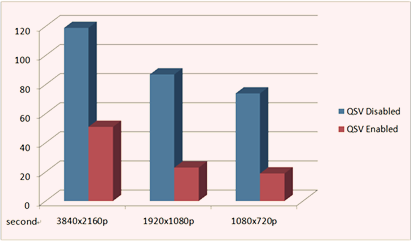 To intuitively illustrate the speed improvement brought by the QSV hardware acceleration technology, here we have compared the encoding time required to process two pieces of files in UHD and HD respectively for the major video encoders on the market, including Wondershare, Xilisoft, DVDFab, Handbrake and Any Converter. Conclusion: While it is already being quite fast for video transcoding, the addition of Quick Sync Video support makes this hardware encoder of h.264 16 times faster. Benefited from this technology, users can not only enjoy a faster hardware encoding process of H.264 files, but also perform other tasks like website browsing, online movies watching etc with less buffering. Combined with this feature, the hardware encoder of H.264 MacX Video Converter Pro furhter reduces the time required for encoding video with H.264 codec, even H265 encoding. First of all, free download the ultrafast H.264 hardware encoder on Mac. Note that to make use of Intel's hardware acceleration, you will need to have a computer with Intel® SandyBridge, IvyBridge, Haswell or Broadwell processors. So before you start the fast hardware encoding process for H.264 files, check if you have the right processor, or you may need a processor upgrade. Step 1: Launch the hardware video encoder for H.264 files and click "Add File" to load the H.264 files you'd like to encode to other formats. You're able to load files in MP4, AVI, MTS, MKV, MOV etc with H.264 codec. Step 2: Choose the format, video settings or device profile (iPhone XS/XR/X/8/7/6s/6s plus/6/iPad Pro/Air 2 more) for the output files. Step 3: Check the Hardware Acceleration QSV option at the lower right of the interface to enable the hardware acceleration for fast hardware H.264 encoding. Step 4: Click the output folder you want to save the output video by clicking "Browse" button. Step 5: After you finish the above steps, click the "RUN" button to start hardware encoding of h264 now. By taking full advantage of the QSV hardware acceleration technology, the hardware h264 encoder will guarantee an ever-faster speed and high video quality.